The more we use Android smartphones and tablets the more we discover about how much we can get out of them. For instance, there’s a growing trend for screen recording, popular with gamers who want to show off their prowess, those who wish to make tutorial videos, and also developers when creating their apps. These are just a few of the reasons you might want to screen record on your Android device, and there are plenty more. When Android 5.0 Lollipop arrived, it finally brought along the native screen-recording feature without the need to root your device, and while screen recording was once a rather trickier process, there are now many third-party apps available on the Google Play Store. This makes the task a whole lot easier to screen record on unrooted devices as we found out for ourselves. So you’ve decided you want to have a go at screen recording and head to the Play Store, only to find a multitude of apps and no idea of which would be the best one for you. That’s where we come in as we’ve been trying out many of the top-rated choices to come up with our own recommendations for the best screen recorder apps for Android. All of the apps below are free to download although some have additional features that you can obtain with in-app purchases. Our picks take in factors such as ease of use, rendering quality, and useful features, so check out the list below and get recording! We simply had to start with this app as it offers just about everything you need and user reviews of 4.6/5 stars show just how useful it is. We found it simple to use, and it’s packed full of features such as setting video resolution from 240p to 1080p, setting bit-rate, no watermarking, saving directory selection, and a customized timer, with a notable addition being the ability to pause and resume while recording. Audio can be recorded from the mic and mixed into the videos, The one drawback we found is that it only works with devices running Android 5.0 Lollipop or later although that will apply to plenty of users. It’s free to download and requires no root access, and no time limit applies although you can choose to upgrade to the pro version with in-app purchases. Extras with this include a magic button feature, a front-camera overlay window, drawing on screen and more. This app has a clean, user-friendly interface and boasts of the lack of restrictions it has. Its many features include the ability to record with two engines (either default or advanced), pause recording (advanced engine only), drawing on the screen as you go, and input from the front or rear camera. You can also set banners and text with customization, trim videos, and more. No rooting is necessary with this app, although again it’s for devices running Android Lollipop or later and some features require in-app purchases. Mobizen can be used without rooting for devices running Android 4.4 KitKat or later. The user-friendliness of this app makes it easy to recommend, and it’s a very quick process to start recording your videos. Features include screen recording in Full HD with 12.0 Mbps and 60 fps, the ability to save to an external SD card, and a clean recording mode with no watermark. Another addition is a FaceCam feature, and to optimize your results the app also includes various editing features such as trim, cut, and more. It’s all free to use, and if you want to remove the ads you can do so via in-app purchases. It’s worth pointing out that there are also dedicated versions of this app on the Google Play Store that are purely for Samsung or LG devices. As long as your Android device is running Android 5.0 or later it’s hard to find fault with DU Recorder with has extremely high user ratings and is entirely free to use. It has an appealing user interface with support for over 20 languages and there are no ads, no recording time limits, and no rooting required. It all worked smoothly in the time we spent using it, and features include the built-in video editor with a multitude of possibilities, image editing, GIF maker, shake gesture to stop the recording, alternative storage location to either SD card or internal storage, and recording of external sound. It has a floating window or notification bar to control screen recording that can be easily hidden, and you can livestream to Facebook, YouTube, or Twitch. Google Play Games may not be the first app that springs to mind but if your main requirement concerns gaming then it could work well for you. The app does include gameplay recording functionality, with games being launched straight from the app and then recorded. Of course the app also includes other gaming aspects such as the ability to create a gamer profile, challenges, leaderboards, and built-in Google Games. This app uses official APIs of Android Lollipop so no rooting is needed as long as your device is running Android 5.0+. It might not have all the bells and whistles of some other screen recording apps, but unlike many there are no in-app purchases and you get all of the features for free. It records at full screen resolution with the option to set the resolution, orientation, and bit-rate. Additionally it can record audio, features a recording start delay, shows a recording notification, and uses cameras as picture-in-picture. Your videos will be conveniently stored in a folder and can be stored on an SD card. This app worked well enough for us although we noticed among the user reviews that other users seemed to either love it or hate it. Still it’s worth giving it a whirl if you have a device running Android 5.0 or later, as there is no rooting required, no ads, no watermarks, and no time limits. It’s easy enough to use, with multiple resolution recording available including HD and Full HD. Videos can be shared through Facebook, YouTube, Dropbox, Drive and more, or simply saved to your device. If you want more, you can pay to access the whole of the ilos ecosystem and share videos between platforms, set video permissions and more. ScreenCam Screen Recorder is an open source project so you can voluntarily contribute to the developers if you wish or obtain the source code from their website. As well as screen recording for devices running Android 5.0 or later (right up to 1440 x 2560 at 30 fps), you can record audio to add to your videos. If you have a smartphone running Android Nougat 7.0 or later you can seamlessly pause or restart the recording, and if you’re fortunate enough to be using a device running Android 7.1 Nougat you can use its app shortcut. Alternatively you can use an app shortcut from a custom launcher, and another bonus is that there are no pesky ads to get in the way. This app has many of the features of some of the other apps we’ve mentioned and enables screen recording (with resolution from 240p to 1080p) and screenshot capture. You can save your videos to any location including an SD card, and the app conveniently supports multiple languages. Features include support for facecam, time delay before recording, a video trimmer, magic button, mic recording, day/night theme support, and the ability to insert text or logo to recordings. If you have a device running Android 6.0 you should take note of the instructions in the app description regarding permissions. This app works without root on devices running Android 5.0 or later but can also work for those running Android 4.4 as long as those devices are rooted. This is a streamlined app with configurable screen recording functionality but you might want to upgrade to the pro version via in-app purchases to get more out of it. With the pro extras you can record with audio for up to an hour with no wasting time sitting in front of a PC, save preferred configurations as presets, and automatically show screen touches throughout the recording. The upgrade also offers a customizable countdown timer, and a shake gesture to turn off the recording. It’s not for everyone though, for instance the developer notes it doesn’t play nicely with some Samsung Exynos-based devices, so you might want to read the app description for fuller details. When selecting which of these apps to try out you should consider your personal requirements and which features you might be particularly looking for. 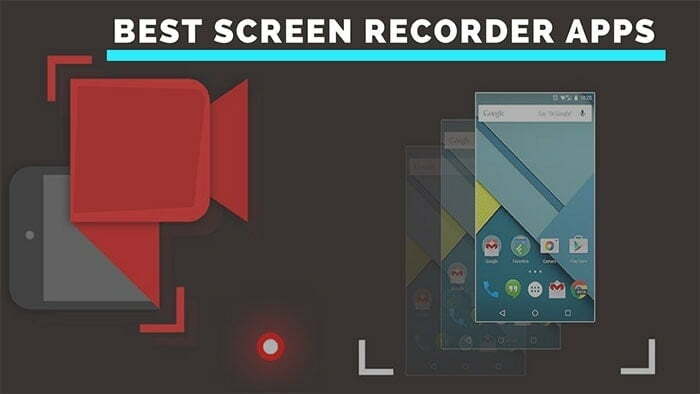 Our picks of the best screen recorder apps for Android cover a range of features so hopefully, you will find something to suit your needs. Are you a novice to screen recording with your Android device, or maybe you are now adept at it and could recommend which of the above apps are your favorites by sending us a comment.